Hello, Hello, Hello!! We missed you all these past two weeks but we’re back with some tasty and healthy treats for you. Spring is here, people have made New Year’s Resolutions to lose weight, eat healthy or just try new things. 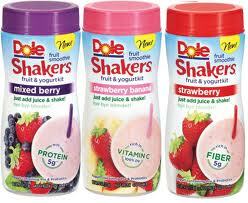 Well today for Taste Test Tuesday we have two new fruit products from DOLE, just for you. In a rush, don’t have your blender handy? Then this is definitely the smoothie for you. Grab a DOLE Shaker from the freezer aisle at your local grocery store, fill it up with juice (approximately 7 oz, there is a line on the bottle), shake it up and there is your fruit smoothie. They come in 3 flavors: Strawberry, Mixed Berry, Strawberry & Banana. Smooth, rich taste of fruit, yogurt and your favorite juice makes this drink a wonderful snack, or even a meal. This drink does have Pre & Probiotics in it, so you will get your live cultures in your diet, and it’s under 200 calories, low in fat, trans-fat free and filled with protein. Each smoothie is considered a single serving (11oz) and can be found in your local grocery stores, so far we haven’t seen any of these for over $2.00 each. Grab a shaker, add your juice and let us know what you think! Great for dessert, a quick snack, or just because. Grab a bowl and enjoy your fruit, that is filled with Vitamin C and contains whole grain oats. See something in the store and not sure how it will taste? Let us know and we will be happy to try it out for you. We love suggestions. Send us a tweet, write on our wall on Facebook, comment on our blog or send us an email. We reply back.